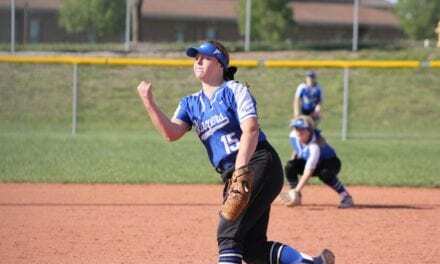 The Gardner-Edgerton High School softball squad dropped a pair of games to Paola, 3-0, 4-3 in non-league action on April 12. In the opener, GEHS lost 3-0 despite a solid pitching performance from Shelby Kaberline. GEHS’s lone hit came from Shelby Plank. Things proved a bit closer in game two as GEHS lost a 4-3 decision. GEHS led 3-1 in the seventh when Paola plated three runs and escaped with a 4-3 win. GEHS scored three runs in the sixth thanks to the hitting of Mackenzie Skeens and Morgan Buie (home run). Look for more local sports stories in our print edition!